Yeah, but: It's neoprene, what's not to like? The Long Version: The Crumpler Noose is a nylon and neoprene camera wrist strap that continues the companies' long tradition of unremarkable and bland product names. Available only in black, it's a mid-weight strap that works well on everything from full-sized SLRs down to mirrorless cameras and large compacts. I like the Noose because it's a sensible size and well made. 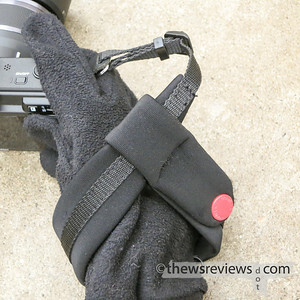 Many of the neoprene wrist straps on the market have cuffs so wide that they could be used for pulling heavy carts, but then the strap connects to the camera via a plastic quick-snap buckle. (Yes, I'm looking at you, Op/Tech.) The Noose costs a bit more than its more primitive cousins, but it also isn't embarrassing to use, which is a big win. Crumpler doesn't include the hardware to attach the Noose to lugs that use split-rings to hold the webbing, such as many Nikon cameras. These should come with the camera, so it isn't a big deal; the attachment ring that I'm using in these photos is from a Domke strap, sold separately. I'm not used to this in a wrist strap, but the Noose has a distinct front and back: it's designed lie flat around your wrist and across the back of your hand. For this to work I need to put my hand through the front – top? – of the loop. I'm used to straps that dangle from under my wrist, and I still get this wrong after a week of frequent use. But the Noose is worth the effort to get right. And rest assured, unlike its namesake, it's not self-tightening. 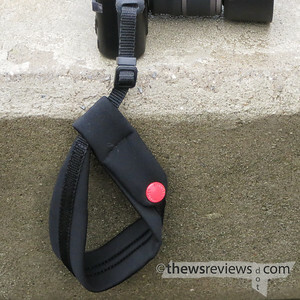 This strap also has a built-in pocket to hold an SD card, which is cleverly tucked into the flap that's secured with the red snap button. I was initially worried that using it would add some stiffness to the strap, but then I actually forgot that I had put a memory card into it, so that allayed my fears. There's just no reason not to tuck a spare / cheap card into it for emergencies. So: it's comfortable, no bigger than it needs to be, adds a useful feature that others don't provide, and looks pretty good while doing it. I have to say that I'm quite pleased with it. If I ever decide to stop carrying my D800 on a shoulder strap, then I'll be back to talk to the helpful people at Aden Camera – my local store – and pick up another Noose.